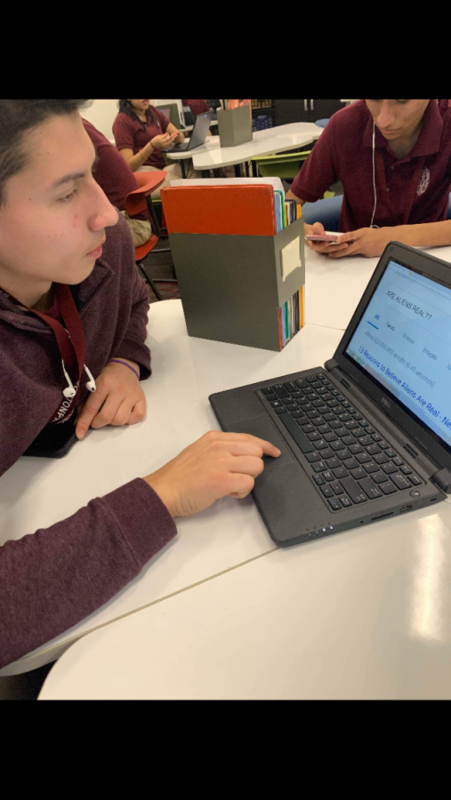 Student Juan Avila searches for proof of extraterrestrial life on Google. Extraterrestrial life is life outside of planet Earth, since Earth is the current place in the universe where life exists. A survey was conducted in 24 countries that showed that “47 percent of the surveys 26,000 respondents believed in the existence of intelligent alien civilization in the universe” (nypost.com). They were then asked if we should be able to communicate with them and “60 percent said we should try to communicate with extraterrestrial beings” (nypost.com). People have been asking recently if the government is hiding anything about extraterrestrial life. “Last month, the New York Times published an article describing a secret government program investigating reports by military pilots of unidentified flying objects they encountered in the course of their daily duties” (cnn.com). “I think that extraterrestrial life is definitely possible and not crazy to believe in. If us humans still haven’t discovered every animal on earth yet, then how can we say there isn’t life out there in space? We can’t be the only ones,” Sophomore Jesus Sanchez said. As previously mentioned, it’s interesting that we haven’t discovered every animal at the bottom of the ocean and have many mysteries and creatures that have yet to be discovered. Sometimes just because you can’t always see them doesn’t mean they don’t exist. “Now that I think of it once I was out camping with my family in the woods on a hot summer night out in the middle of nowhere and I really felt like I saw a UFO (unidentified flying object) like they’re always portrayed. It looked like a plate just hovering back and forth in the distance, but when I told my family they wouldn’t buy it,” Senior William Santos said. It’s interesting to see people have even experienced UFO encounters first hand themselves. It’s more than likely a weird feeling to not know what it is exactly that is happening as it unfolds and leaves you with so many unanswered questions. “I always like watching documentaries and videos on YouTube about anything that has to do with space and especially aliens. Now that I think of it, I feel that it can’t be denied that extraterrestrial life is possible at least or else there wouldn’t be so many questions,” College sophomore Everardo Rodriquez said. Social media has likely had a large impact on our beliefs about life outside of earth. News articles and countless videos on YouTube try to answer these questions. Often people watch them during their free time and ponder about if it could be true after all. But there’s a chance some people doubt this theory. “I really don’t believe in aliens or anything like that because ever since I was young, I’ve always gone to church and was raised in a very religious environment, so for me to believe in aliens would go against my religious beliefs,” Cicero resident/parent Silvia Chavez said. After asking a wide variety of people if they believe in extraterrestrial life, one person has finally said they do not believe in the idea of extraterrestrial life on other planets. This person was likely influenced by her answer by the environment in which she lives in goes against any outside life apart from planet earth. “I really feel like NASA is hiding something from us that they don’t want us to find out. Like “Area 51” is one of them and I bet there’s way more than just that. Maybe it’s not aliens, but something bigger,” Junior Alex Sanchez said. It could be true that the U.S government may be hiding something after heavy speculation about area 51 and its security at the base. To conclude more people on average, believe that there is life outside of just earth, but although we don’t have an indefinite answer about what it is or looks like. There’s always a chance for new discoveries to be mad and time will tell. This article has me interested in space activity, because given the data they provided many believe extraterrestrial life exists. Not only that but the fact that one had an experience with a UFO, shows that there might be life outside of Earth. Although it is just a theory, people can accept to whether or not to believe in it, such as the woman who said it would go against her beliefs. Majority of the school sampled was for the theory, and this was interesting because the people I’ve asked tend to say that they don’t believe in other life. The statement made from a student about that we haven’t found all ocean life, so who knows if there’s other life, sparks more interest in me to study more of space activity. In my opinion, I do believe that there is life outside of Earth because there is no way it is just only humans on Earth. The universe is too big for there not to be life on other planets. I also feel like the government already knows that there is life, they just want to hide it from us maybe so we don’t freak out. They haven’t given any information about Area 51 so there is definitely something in there that they don’t want us to know. But I do think in a couple years, we will find out the truth on whether or not there is extraterrestrial life. I think that it is important that we know what happens in the rest of the world and the things outside of it. It would be great to know that we are not alone in the universe. It would also be interesting the diverse ways that extraterrestrial life could be if they evolved in a different way.